HIGH school dropout Tim Cauling is down on his luck when his dad’s best friend offers him a job. 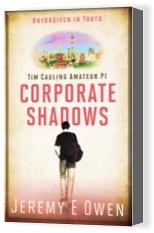 Will Tim have what it takes to be a PI and reclaim what is rightfully his? Only time will tell. Join Tim on his first case and as he sets out on an international escapade in Japan. The Missing Teacher is live!